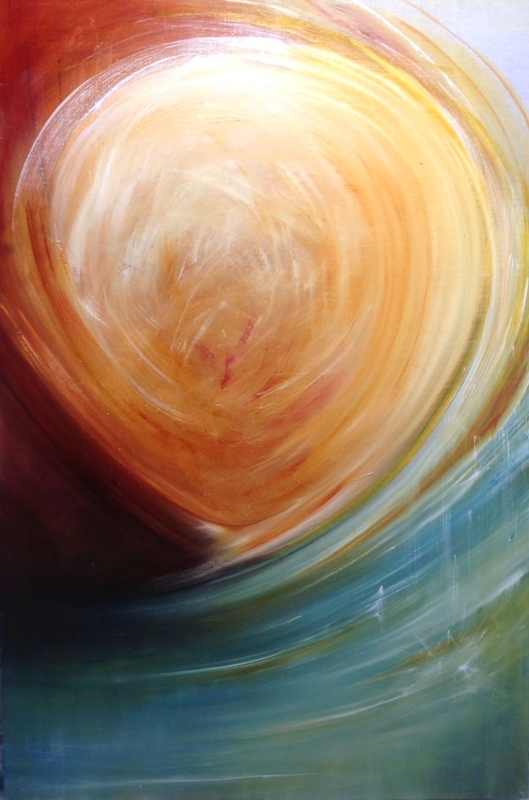 Below are a series of images of the one painting by artist Libby Byrne, painted during the talks in the Merri Creek Anglican series on Fruit of the Spirit. Libby develops the work during the sermon in response to what is preached. It is a form of worship and visual communication. For visual learners it’s another way of engaging. This is essentially an experienced based painting. The intention of the work was to create a tangible expression of the experience of being with the Word of God in worship with others as Merri Creek Anglican began. The privilege of making this painting as we have worshipped together, has allowed me to be awake and physically present to the message we have been hearing. 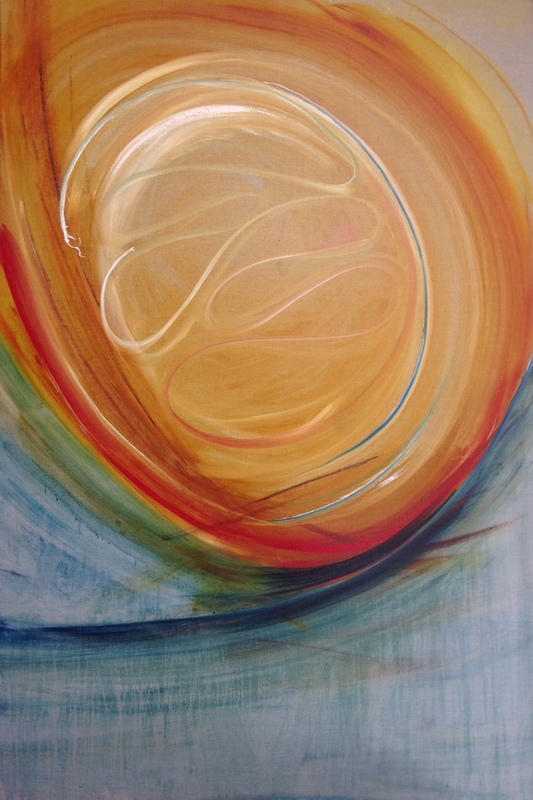 Applying paint to the canvas has been a way for me to see what it is that I think I am hearing – and to share that with others who are hearing and experiencing the same message, in their own unique ways. As I now try to write about the way in which this piece developed, I am drawing upon my own experience as a painter and the conversations that I have shared with those of you who have seen the work take shape along the way. We began church together with the image of the cool breeze of Gentleness and for me there was the sheer delight in being with this almost whimsical idea. The first week was a simple, fresh beginning. At the end of the service the painting was still open for interpretation and in some ways it could well have been just enough to just rest with this and allow it to stand on its own. Indeed I think that some people may have been surprised that there was more to come. However, beginning the journey was really the easy part. Finding a way to develop the image in time with the message would require discipline and commitment. It required a preparedness to put other things aside and make this emerging image a priority, both in worship each week and in my own studio practice. And so in the second week we began to work with Love. I was surprised to find that the simplicity of the first gentle breeze was somehow lost in the midst of love. Simple lines were becoming a solid shape and although I tried to resist developing a recognisable form at this early stage – by the end of the second week I could not deny that there now seemed to be a burgeoning pregnant belly in the midst of the painting. Whimsy had been transformed into something that was not only growing, but was almost intentional and solid. As I considered how to work with this form in the week ahead, I was troubled by the fact that the solid form was also hovering above what could easily become a body of water. I struggled to decide how these two competing images could sit together in the weeks ahead. The weight of making a decision about how to resolve the image for the congregation was difficult. I was tired, I was vulnerable and I was lost. It was an uncomfortable time and yet familiar. As the days passed, I realised that this was the chaos that is always the prelude to order. This chaos is the essence of creativity and I needed to move gently within it. It was then that I was able to surrender once again the intention of this creation. In the darkness of the experience of that week, I realised I needed to find a place in the painting for the darkness of sacrifice. For we know light by the shadow it casts – and if the light of God’s love was in this work, then there must also surely be a place for the shadow of sacrifice. 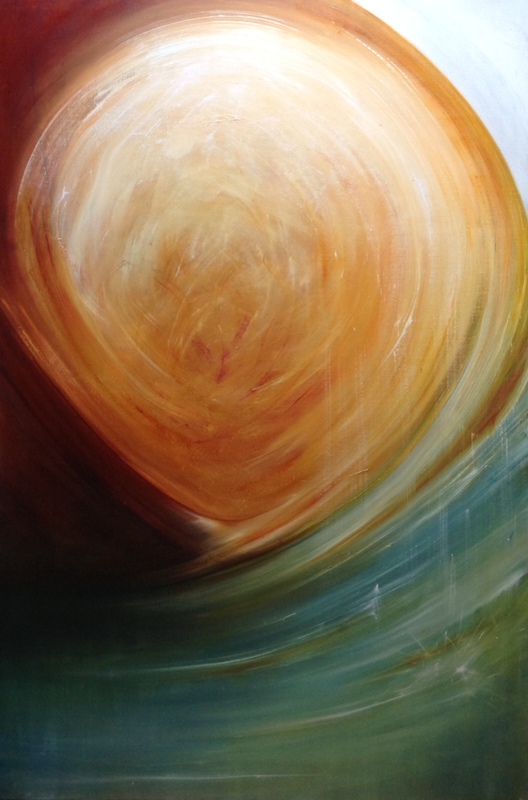 As this darkness found its place, there was a new depth to the painting and the large burgeoning pregnant shape could also be conceived as a vortex. The water rose up forming the arc of a large wave. I could hear the earth groan as in the pains of labour in Romans 8: 22 -26 and yet I could also sense the mystery of the Spirit who hovered over the water in Genesis 1. Scripture was able to hold the tension of these two images and so offered a way to move with this chaos into the third week. As we considered Joy – a single droplet of water descended from the light and joined the deep flowing river of life, the movement of God. As I witnessed the gentle splash I was reminded of gentleness. I was relieved that she was not lost to more serious and solid things. I found gentleness dwelling in the midst of something much larger, in the midst of love. I think that seeing the integration of these ideas somehow led me to trust that the image of Peace was able to hold the chaos and confusion of our human experience within a very real hope that there was more. Even as the Spirit hovered over the water (Gen 1) it was Peace that led me to consider that the source of the water itself could be flowing from the throne of God (Rev 22). The painting was now a place in which I could see the depth and breadth of what it means to do life with God – indeed how high, wide, deep and long is the love of Christ. Others were beginning to see it too. And yet just as I was ready to settle and relax into the arc of all these places and colours, the final sermon about the gift of Self Control – called me beyond this canvas to consider the edges of the painting. This final week was a reminder that despite my own desire to know and understand God in the making of this image, the image always begins and is shaped by God who desires me – calls me, awakens me and longs to shape me in a way that is pleasing to Him. As I have desired to shape this canvas in a way that is pleasing to God, so God has responded in the canvas and has shaped my desire, ultimately turning my attention to Christ. As I have been making this work within our worship services, people have told me that it has been soothing, therapeutic and relaxing to watch the painting grow. And they have also told me that it has awakened them to what is being said and even challenged them to be on the edge of their seat – as they have hoped I will move the colour in particular ways. They have shared their stories with me and sometimes their experience of the gospel seems to have been held within the different elements of this painting. 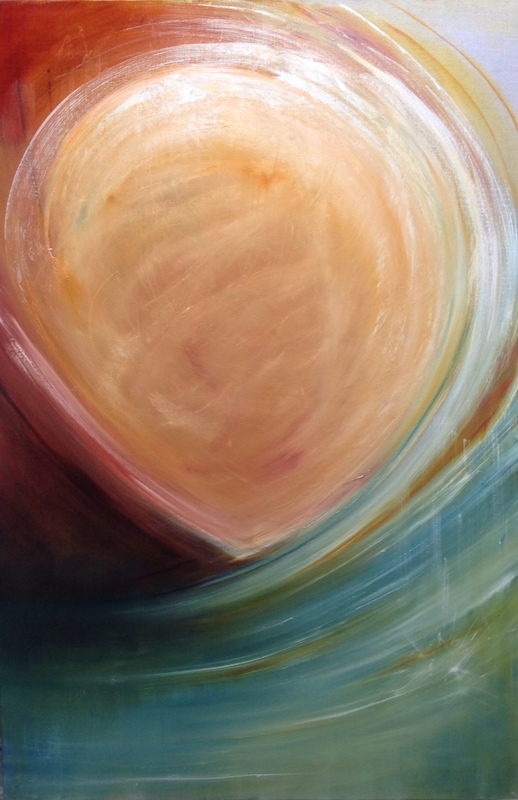 As an artist – this is what it is really about – not the material object of the painting, but capacity of the work to call us into relationship with one another and with God. The painting gives us the opportunity to not only hear the Word of God, but to also see it taking shape. 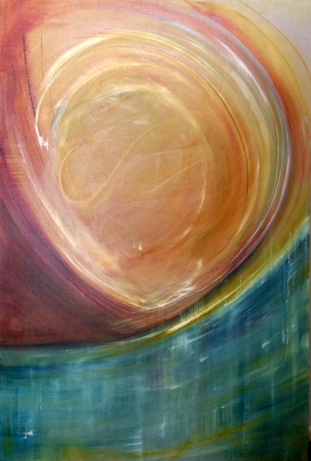 This painting is still a beginning… an expression of creative potential that is growing and moving in and around us. As I look at the image now, it seems that the Word of God is swelling and growing amongst us and is calling for a response. I wonder what it has been like for you to experience being with this painting as it has taken shape. I wonder if it calls you to make a response? 22 We know that the whole creation has been groaning in labour pains until now; 23 and not only the creation, but we ourselves, who have the first fruits of the Spirit, groan inwardly while we wait for adoption, the redemption of our bodies. 24 For in hope we were saved. Now hope that is seen is not hope. For who hopesfor what is seen? 25 But if we hope for what we do not see, we wait for it with patience.